THE MARITIME GRACE AND ELEGANCE are well expressed in this photograph of the Herzogin Cecilie. Launched In 1902 at Bremerhaven, the vessel was built for the North German Lloyd Line, to serve as a training ship. A steel, four-masted barque, originally of 3,242 gross tons she was used as a training ship for cadets, and she could carry 4,000 tons of cargo. Before the war of 1914-18 the ship made several fast voyages, including one from Beachy Head, on the Sussex coast, to Adelaide, South Australia, in seventy-eight days. FEW will question the right of the Herzogin Cecilie to be considered as the crack sailing ship at sea. To decide a point such as this to-day, when the few remaining sailing ships in service are so varied in character, is difficult, but the flagship of Gustav Erikson’s Finnish fleet, the biggest sail fleet in existence, has reason to be so considered. A magnificent ship, she was built regardless of expense and has been well maintained. Her history is an interesting one. As far back as 1896, the North German Lloyd line decided to run its own sail training ships. Even then the sailing ship was disappearing and, as the German regulations still insisted on sail experience before granting a master’s certificate, there was the possibility of a shortage of the type of officer which the line wanted for its big fleet. The Grand Duke of Oldenburg interested himself in the idea from the first and was made the president of the scheme. 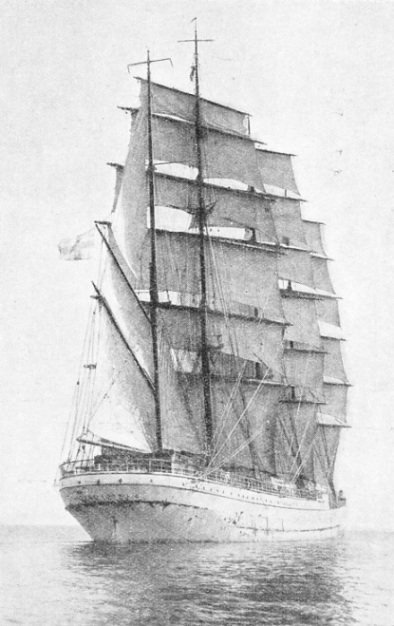 The sailing ship Albert Rickmers, a fine vessel of 2,581 tons, was bought and refitted as the training ship Herzogin Sophie Charlotte, and began her work in 1900. So successful was she that the company decided to build a second ship designed for training purposes. 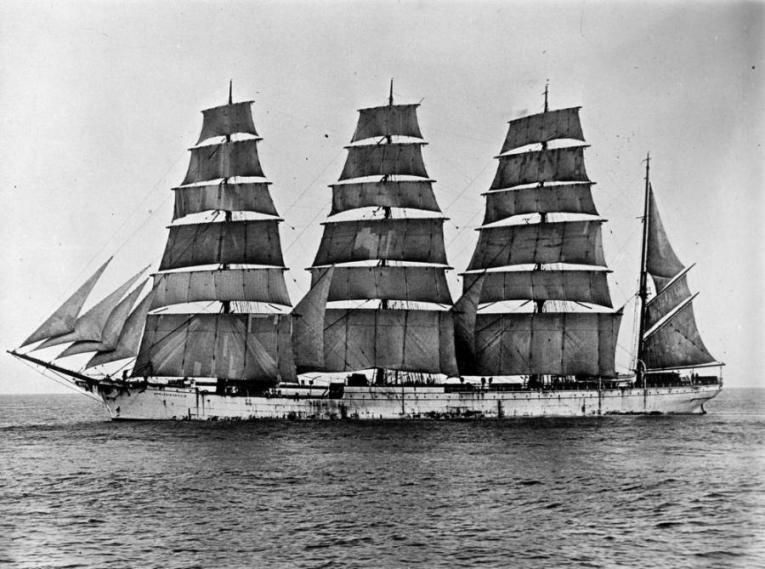 Accordingly, the Rickmers Yard at Bremerhaven, a firm which had great experience in building as well as running big sailing ships, was commissioned to build the Herzogin Cecilie, which was launched in 1902. She was originally a steel, four-masted barque with a gross tonnage of 3,242. Although a big cargo-carrier, she was given accommodation for a large number of cadets, the poop being carried from right aft to forward of the mainmast, where there was only a short well deck between it and the forecastle. She was lofty and heavily sparred, even the royal masts being of steel, with large sails and not a single reef point in the whole sail plan. This design made her a difficult. ship to work, but she was intended to carry so many cadets that there was no apprehension on that score. She was not fitted with any labour-saving devices, such as brace or halliard winches, as were most German ships. When she was new, her captain had under him four mates, two instructor officers, a surgeon, a purser, a boatswain, a few paid hands, and about sixty cadets - strong youngsters ranging from about nineteen to twenty-two years of age. With this crew, labour-saving devices were not necessary; but under the Finnish flag she has been running with a crew of about twenty-five - on one occasion as few as nineteen - and she is what the old sailor man would describe as “a proper workhouse”. Under the North German Lloyd, cadets paid a premium of about £40 a year for their keep and tuition, and some of the finest lads in the country applied for admission. They did practically all the work of the ship, only a few paid hands being shipped to act as stewards and the like. Cadets were rated as able-bodied seamen in their third year. The number of cadets on board, and the careful system of instruction, permitted them to receive a theoretical as well as a practical training. Moreover, the fact that she could carry well over 4,000 tons of cargo, and was fitted with steam winches for working it, permitted them to have a thorough experience of that side of “sailorizing” as well. Having finished their three years in the Herzogin Cecilie, and passed a stiff examination, they were signed on by the North German Lloyd as fourth officers of their steamers and, barring accidents, stayed under that flag for the remainder of their career. The ship remained on this training service until the war of 1914-18, carrying cargo of all kinds and making some quite creditable passages. Outward she generally carried a cargo of German manufactured goods; homeward she carried a bulk cargo, sometimes nitrates from the West Coast of South America, sometimes grain from San Francisco or Australia. She made one passage from Caleta Buena to Falmouth in ninety-nine days, one from Beachy Head to Adelaide in seventy-eight, and another from Mexillones to the Isles of Scilly in sixty-three days. She left Bremerhaven in May, 1914, and arrived at Guayacan to load nitrates j ust before war broke out. That being a neutral port she prepared to remain there until the end of the war, but before the Armistice was moved up to Coquimbo. After the Armistice she was allotted to the French, but they already had more sailing ships than they needed, and had recently decided to end their subsidy scheme which encouraged the building and running of sailing tonnage. She went to Antofagasta to be fitted for her return to Europe, although there was little wrong with her after her long stay in tropical ports. It was not until October, 1920, that she finally sailed for Ostend, making a good passage, but striking the quay wall when she arrived and losing both anchors and chains. There she was laid up pending the arrival of a purchaser. At that time Captain Gustav Erikson, a Finnish master mariner, was building up what was later to become the biggest fleet of sailing ships in the world. He had sent his commodore master, Captain Reuben de Cloux of the Lawhill, down to Marseilles to inspect the former German sailing ship Passat, which was offered for sale at £11,000. THE FLAGSHIP of Gustav Erikson, an important Finnish shipowner, the Herzogin Cecilie, as she is to-day, has a gross tonnage of 3,111. The vessel is used as a training vessel for young Finnish sailors. Her first charter under the Finnish flag was to carry a cargo of timber from Fredrikstad to Melbourne in 1922. Despite bad weather, the outward voyage was made in ninety-two days. The ship has been sailing with a crew of about twenty-five, and on occasion with only nineteen. By chance Captain de Cloux called at Ostend on his way and there saw the Herzogin Cecilie offered for £4,000. He inspected her thoroughly with a critical eye, found her to be in perfect condition, and did not trouble to go on to Marseilles, buying her on the spot. A rival Finnish owner had examined her shortly before, but had decided not to bid for her, fearing that she would require too many men and would be too costly to run. Instead he bought the four-masted barquentine Mozart for the same price, a ship which was specially designed to be run with as few men as possible. The Herzogin Cecilie proved to be the more profitable ship, and, while the Mozart has had to go to the scrappers, the former is still in first-class condition and has many years of life in her. Captain Erikson was delighted with his bargain, and, knowing her previous history, determined to keep her fitted as a training ship, to give as many Finnish lads as possible a chance of learning sea ways. So successful was this scheme that he put several of his other big sailing ships to the same purpose. He now provides practically the only chance of sail training to a large number of lads of all nations - Finnish, Swedish, Norwegian, Estonian, German and British. Captain de Cloux was put in command of her at Ostend - a fine sailor and a whole-hearted enthusiast in the training of boys. He was then thirty-six years old and had commanded big sailing ships for about five years. Regarded by many as the best all-round sailing-ship master under the Finnish flag, he had got a good passage out of his previous command, the Lawhill, which was not built for speed. Her first charter under the Finnish flag was to carry a cargo of timber from Fredrikstad to Melbourne in the summer of 1922. Outward she made a passage of ninety-two days, although meeting a terrific gale a few hundred miles from her destination, which put two steamers ashore and delayed her for a week. Unable to find a cargo in Australia, she left in ballast for Taltal in Chile, making a smart passage of thirty-five days and keeping up an average of fourteen knots for a considerable time. She brought home nitrate and went out again to Chile, making a ninety-nine-days passage from Caleta Buena to Falmouth by way of Fayal. She was on the Pacific Coast again in 1924, but at the beginning of 1925 she sailed for Australia, made an intermediate run from Port Lincoln to Callao and back. In February, 1926, she sailed from Port Lincoln to Falmouth, for orders, with grain. The South Australian grain business, which was beginning to be the only opportunity of the big sailing ship, suited her, and she has been on it ever since. The homeward passage of the grain fleet has been made a race which attracts great attention, and the Herzogin Cecilie has made for herself an excellent reputation on it. In 1927, under Captain de Cloux, she arrived at Queenstown eighty-eight days out of Port Lincoln, the first ship home out of thirteen and recording the best time in the year. Many passengers travel in this fine ship for the sake of adventure. You can read more on “Hell Ships and Floating Homes”, “In the Sailing Ship’s Forecastle” and “Speed Under Sail” on this website.